A lord-lieutenant (/lɛfˈtɛnənt/) is the British monarch's personal representative in each county of the United Kingdom. Historically, each lieutenant was responsible for organising the county's militia. In 1871, the lieutenant's responsibility over the local militia was removed. However, it was not until 1921 that they formally lost the right to call upon able-bodied men to fight when needed. Lord-lieutenant is now an honorary titular position usually awarded to a retired notable person in the county. Lieutenants were first appointed to a number of English counties by King Henry VIII in the 1540s, when the military functions of the sheriff were handed over to him. He raised and was responsible for the efficiency of the local militia units of the county, and afterwards of the yeomanry, and volunteers. He was commander of these forces, whose officers he appointed. These commissions were originally of temporary duration, and only when the situation required the local militia to be specially supervised and well prepared; often where invasion by Scotland or France might be expected. Lieutenancies soon became more organised, probably in the reign of his successor King Edward VI, their establishment being approved by the English parliament in 1550. However, it was not until the threat of invasion by the forces of Spain in 1585 that lieutenants were appointed to all counties and counties corporate and became in effect permanent. Although some counties were left without lieutenants during the 1590s, following the defeat of the Spanish Armada, the office continued to exist, and was retained by King James I even after the end of the Anglo-Spanish War. [T]he King's most Excellent Majesty, his Heirs and Successors, shall and may from Time to Time, as Occasion shall require, issue forth several Commissions of Lieutenancy to such Persons as his Majesty, his Heirs and Successors, shall think fit to be his Majesty's Lieutenants for the several and respective Counties, Cities and Places of England and Dominion of Wales, and Town of Berwick upon Tweed. Although not explicitly stated, from that date lieutenants were appointed to "counties at large", with their jurisdiction including the counties corporate within the parent county. For example, lieutenants of Devon in the seventeenth and eighteenth centuries appointed deputy lieutenants to the City of Exeter, and were sometimes described as the "Lieutenant of Devon and Exeter" The one exception was Haverfordwest, to which a lieutenant continued to be appointed until 1974. The origin of this anomaly may have lain in the former palatine status of Pembrokeshire. The City of London was uniquely given a commission of lieutenancy, and was exempt from the authority of the lieutenant of Middlesex. The Constable of the Tower of London and the Warden of the Cinque Ports were ex-officio lieutenants for the Tower Hamlets and Cinque Ports respectively, which were treated as counties in legislation regarding lieutenancy and militia affairs. The official title of the office at this time was His or Her Majesty's "Lieutenant for the county of x", but as almost all office-holders were peers of the realm, they were referred to as "Lord-Lieutenant". An Act to make the Militia of this Kingdom more useful (Geo 2, c.9) was passed by the Parliament of Ireland in 1715. This provided for the issuing of commissions to appoint persons as "his Majesty's lieutenant or lieutenants, governor or governors, and commissioners of array for the several and respective counties, cities, and places of Ireland". The lieutenants were empowered to embody militia regiments. When the Irish Free State became independent of the UK in 1922, British rule ceased to exist. In 1921, with the establishment of Northern Ireland, lord lieutenants continued to be appointed through the Governor of Northern Ireland to the six counties and two county boroughs. In 1973 the counties and county boroughs were abolished as local government units in Northern Ireland, and lord-lieutenants are now appointed directly by the Queen to "counties and county boroughs... as defined for local government purposes immediately before 1 October 1973". Although Colin, Earl of Balcarres was appointed Lord Lieutenant of Fife in 1688, and lieutenants were appointed to a few counties from about 1715, it was not until 1794 that permanent lieutenancies were established by Royal Warrant. By the Militia Act 1797, the lieutenants appointed "for the Counties, Stewartries, Cities, and Places" were given powers to raise and command county militia units. The Lord Provosts of Edinburgh, Glasgow, Aberdeen, and Dundee are, by virtue of office, also the lord-lieutenant of their respective city. 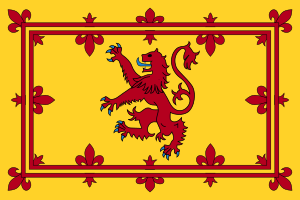 While in their lieutenancies, lord-lieutenants are among the few individuals in Scotland officially permitted to fly the banner of the Royal Arms of Scotland, or "The Lion Rampant" as it is more commonly known. The Militia Act 1802 provided for the appointment of lieutenants to "Lieutenants for the Counties, Ridings, and Places" in England and Wales, and gave them command of the county militia. In the case of towns or cities which were counties of themselves, the "chief magistrate" (meaning the mayor, chief bailiff or other head of the corporation) had the authority to appoint deputy lieutenants in the absence of an appointment of a lieutenant by the crown. The Regulation of the Forces Act 1871 removed the lieutenant as head of the county militia, as the jurisdiction, duties and command exercised by the lieutenant were revested in the crown, but the power of recommending for first appointments was reserved to the lieutenant. The Militia Act 1882 revested the jurisdiction of the lieutenants in the crown. This was a formal recognition of the situation that had existed since 1662 that the lieutenancies for the majority of counties corporate in England were held jointly with their associated county—for example a lieutenant was now appointed for "the County of Gloucester, and the City and County of Gloucester, and the City and County of City of Bristol". Haverfordwest was permitted to retain a lieutenant while the Tower Hamlets and Cinque Ports were to continue to be regarded as counties for lieutenancy purposes. From 1889 lieutenancy counties in England and Wales were to correspond to groupings of administrative counties and county boroughs established by the Local Government Act 1888. The creation of a new County of London also led to the ending of the Tower Hamlets lieutenancy. The Act also extinguished the lieutenancy of the Cinque Ports. Section 69 of the Local Government (Ireland) Act 1898 realigned the lieutenancy counties with the new administrative counties created by the Act. The one exception was County Tipperary, which although administered by two county councils, was to remain united for lieutenancy. In contrast to the legislation in England and Wales, each county borough was to have its own lieutenant, and those counties corporate not made county boroughs were abolished. The effect of this was to create a lieutenant for the county boroughs of Belfast and Londonderry, and to abolish those for the city of Kilkenny, borough of Drogheda and town of Galway. The office of lieutenant was honorary and held during the royal pleasure, but virtually for life. Appointment to the office is by letters-patent under the great seal. Usually, though not necessarily, the person appointed lieutenant was also appointed custos rotulorum or keeper of the rolls. Appointments to the county bench of magistrates were usually made on the recommendation of the lieutenant. The Territorial and Reserve Forces Act 1907 established County Territorial Force Associations, of which the lieutenant was to be head, styled president of the county association. It restated the combination of counties and counties corporate as lieutenancy counties. In 1921, with the establishment of Northern Ireland, lieutenants continued to be appointed through the Governor of Northern Ireland to the six counties and two county boroughs. The creation of the Irish Free State in the following year saw the remaining county lieutenancies in Ireland abolished. In 1973 the counties and county boroughs were abolished as local government units in Northern Ireland, and lord-lieutenants are now appointed directly by the sovereign to "counties and county boroughs... as defined for local government purposes immediately before 1 October 1973". In 1975 the term lord-lieutenant officially replaced that of lieutenant. Local government reform in England in 1965 led to the appointment of lieutenants to Greater London and Huntingdon and Peterborough, and the abolition of those of the counties of London, Middlesex and Huntingdon. A more fundamental reform of local government throughout England and Wales (outside Greater London) created a new structure of metropolitan, non-metropolitan and Welsh counties in 1974. Section 218 of the Local Government Act 1972 that established the new system stated: "Her Majesty shall appoint a lord-lieutenant for each county in England and Wales and for Greater London..." The Act appears to be the first statutory use of the term "lord-lieutenant" for lieutenants to counties. Existing lord lieutenants were assigned to one of the corresponding new counties wherever possible. Where this could not be done, the existing office-holder became a lieutenant of a county, junior to the lord-lieutenant. For example, the Lord Lieutenant of Montgomeryshire was appointed Lord Lieutenant of Powys, with those of Breconshire and Radnorshire each being designated as simply "Lieutenant of Powys". This measure was temporary, and no lieutenants have been appointed in this way since 1974, although the power still exists. In 1975 counties ceased to be used for local government purposes in Scotland. The Local Government (Scotland) Act 1973 replaced the counties with regions, and each region was to have one or more lord-lieutenants appointed. The areas to which they were appointed approximated to the counties and were based and were defined in terms of the new local government districts. In 1996 Scottish regions and districts were abolished on further local government reorganisation, and since that date lord-lieutenants have been appointed to "lieutenancy areas", roughly equivalent to the old Scottish counties. Partial reform of local government in England since 1995 has led to the creation of so-called ceremonial counties to which lord-lieutenants are now appointed. The Lieutenancies Act 1997 is the most recent piece of primary legislation dealing with Lieutenancies in England and includes the definitive list of the current areas used. Ceremonial counties may comprise combinations of county council areas and unitary authorities. Since the local government re-organisation of 1996 in Wales, lord-lieutenants are now appointed to "preserved counties", i.e. the counties used for administrative purposes from 1974 to 1996. The City of London was unaffected by changes introduced since 1882. It has a Commission of Lieutenancy rather than a single lord-lieutenant. The head of the commission is the Lord Mayor of the City of London. Lord-lieutenants are the monarch's representatives in their respective lieutenancies. It is their foremost duty to uphold the dignity of the Crown, and in so doing they seek to promote a spirit of co-operation and good atmosphere through the time they give to voluntary and benevolent organisations and through the interest they take in the business and social life of their counties. Chairing the local Advisory Committee for the Appointment of the General Commissioners of Income Tax, a tribunal which hears appeals against decisions made by the HM Revenue and Customs on a variety of different tax related matters. As the sovereign's representative in his or her county, a lord-lieutenant remains non-political and may not hold office in any political party. They are appointed for life, although the customary age of retirement is 75 and the sovereign may remove them. Each lord-lieutenant is supported by a vice lord-lieutenant and deputy lieutenants that he or she appoints. The vice lord-lieutenant takes over when the lord-lieutenant is abroad, ill, or otherwise incapacitated. The lord-lieutenant appoints between thirty and forty deputy lieutenants depending on the county's population. They are unpaid, but receive minimal allowances for secretarial help, mileage allowance and a driver. Male lord-lieutenants receive an allowance for the ceremonial uniform, worn when receiving members of the Royal Family and on other formal occasions. There is no uniform for a female lord-lieutenant, but there is a badge which can be worn on ceremonial occasions. Since at least the eighteenth century a military-style uniform has been worn by male lieutenants (appropriate to the military origins of the post). Since 1831 this has been analogous to the uniform worn by a general staff officer, but with silver lace in place of the gold worn by regular officers. Over time, the design of the uniform changed in line with changes made to army uniform. At present, it is a dark blue uniform in the style of a General Officer's Army No. 1 dress (but with buttons, shoulder-boards, sash etc. in silver rather than gold). A cap is worn, and a sword with a steel scabbard. The badge on the cap etc. varies depending on where the Lieutenant's County is situated: a rose is worn in England, shamrocks in Northern Ireland, a thistle in Scotland and Prince-of-Wales feathers in Wales. The uniform for a male vice lord-lieutenant and for deputy lieutenants is of a similar style, but with features to distinguish it from that of a lord-lieutenant. The Lord Lieutenant of Ireland was the head of the British administration in Ireland until the foundation of the Irish Free State in 1922. In conversation: '(Title and name)' or 'Lord-Lieutenant'. Plural: 'Lord-lieutenants', although the historic form of 'Lords-Lieutenant' frequently appears. In the colonies of the English Empire, and subsequently the British Empire, the duties of lords lieutenant were generally performed by the commander-in-chief or the governor. Both offices may have been occupied by the same person. By way of an example, this is still the case in Britain's second, and oldest remaining, colony, Bermuda, where the Royal Navy's headquarters, main base, and dockyard for the North America and West Indies Station was established following independence of the United States of America. The colony had raised militia and volunteer forces since official settlement in 1612 (with a troop-of-horse added later), and a small force of regular infantry from 1701 to 1783. A large regular army garrison was built up after 1794, and the reserve forces faded away following the conclusion of the American War of 1812 as the local government lost interest in paying for their upkeep. From this point until the 1960s, governors were almost exclusively senior officers of the Royal Artillery or Royal Engineers who were also military commanders-in-chief (and initially also vice admirals). Attempts to rekindle the militia without a Militia Act or funds from the colonial government were made throughout the century under the authorisation of the Governor and Commander-in-Chief, but none proved lasting. The colonial government was finally compelled to raise militia and volunteer forces (the Bermuda Militia Artillery and the Bermuda Volunteer Rifle Corps) by act in the 1890s (the Bermuda Cadet Corps, Bermuda Volunteer Engineers, and Bermuda Militia Infantry were added at later dates), and these fell under the Governor and Commander-in-Chief, as well as under operational control of his junior, the brigadier in charge of the Bermuda Command (or Bermuda Garrison), which included the regular as well as the part-time military (as opposed to naval) forces in the colony. Although the Royal Naval and the regular army establishments have been withdrawn from Bermuda, the Governor of Bermuda remains the Commander-in-Chief (though most recent office holders have not been career army officers) of the Royal Bermuda Regiment (a 1965 amalgam of the BMA and BVRC, which had both been reorganised in line with the Territorial Army after the First World War). In France and Italy, the role of Prefect (préfet in French, prefetto in Italian) is different to that of lord-lieutenant, as the regional and departmental prefects of France are responsible for delivering as well as control functions of public services. In Sweden Landshövding and Norway "Fylkesmann", the regional governor is responsible for administrative control functions of services delivered and decisions made by local and county municipalities, as well as representing the king in the region. In the Netherlands, King's Commissioner (Commissaris van de Koning in Dutch) is appointed by the monarch, but unlike a lord-lieutenant, belongs to a political party. ^ "Definition: Lieutenant". Collins Dictionary. n.d. Archived from the original on 2 April 2015. Retrieved 31 December 2014. ^ "History of the Lieutenancy". www.surreylieutenancy.org. Archived from the original on 3 September 2017. One or more of the preceding sentences incorporates text from a publication now in the public domain: Chisholm, Hugh, ed. (1911). "Lieutenant". Encyclopædia Britannica. 16 (11th ed.). Cambridge University Press. p. 599. ^ a b c Webb, Sidney; Webb, Beatrice (1906). "1: The Parish and the County". English Local Government from the Revolution to the Municipal Corporations Act. London: Longman's Green and Co. pp. 283–287. ^ Historical Manuscripts Commission (1916). "The city of Exeter: Commissions, pardons etc". Report on the Records of the City of Exeter. British History Online. Archived from the original on 2011-05-26. Retrieved 2009-01-29. ^ Henderson, Thomas Finlayson (1893). "Lindsay, Colin" . In Lee, Sidney. Dictionary of National Biography. 33. London: Smith, Elder & Co. pp. 286–288. ^ Witherow, John, ed. (8 June 2018). "Barry Dodd - Obituary". The Times (72556). p. 54. ISSN 0140-0460. ^ Anson, William (1907). The Law and Custom of the Constitution. II: The Crown. Part I. Oxford: University of Oxford. p. 264. ^ Text of The Lord-Lieutenants (Scotland) Order 1996, Statutory Instrument 1996 No. 731 (S.83). as originally enacted or made within the United Kingdom, from legislation.gov.uk. Retrieved 3 May 2001. ^ Text of the Lieutenancies Act 1997 (1997 c.23) as in force today (including any amendments) within the United Kingdom, from legislation.gov.uk. ^ Text of the Preserved Counties (Amendment to Boundaries) (Wales) Order 2003 as originally enacted or made within the United Kingdom, from legislation.gov.uk. Retrieved 3 May 2011. ^ Mansfield, A., Ceremonial Costume. London: A & C Black, 1980. ^ https://archive.org/stream/dressinsigniawor00greauoft#page/56/mode/2up Uniform as worn prior to the Second World War, illustrated in Dress Worn at Court, Lord Chamberlain's Office, 1921. ^ "Lord-Lieutenants". The Royal Household. Archived from the original on 19 August 2012. Retrieved 29 August 2012. ^ travis.smith-simons (3 March 2016). "The Governor of Bermuda". www.gov.bm. Archived from the original on 10 February 2018. Retrieved 7 May 2018. ^ Shorto, Gavin (5 April 2018). "The Good Governor". The Bermudian. Retrieved 10 May 2018.